All Doosan forklifts are designed with a simple ethos – to make Doosan machines the best value on the market. That means using proven technology and rugged, durable components to ensure low lifetime operating costs and minimal maintenance. The cornerstone of our business. The complete range of electric, LPG and diesel models is Doosan’s most successful ever, with a host of great features and class leading ergonomics. AC Technology on all electric models. Oil cooled disk brakes provide excellent long term response, in any application – wet or dry. 10,000 hour service life means there’s minimal maintenance and therefore minimal cost. Integrated sideshift is another standard Doosan feature usually offered by competitors as a costly extra. Reliable, powerful and well proven engine and transmissions. Comprehensive 3 Years manufacturer’s warranty. Doosan’s own research suggests that their machines offer the lowest lifetime costs. Despite this, the company still offers one of the best warranties around, giving even greater peace of mind. The warranty comes as standard covering parts and labour. Founded over 110 years ago, Doosan now employs over 43,000 people in 38 different countries and has annual revenues in excess of US$40.6-billion, making it one of the largest corporations in Korea. Doosan’s strength has come from its vast array of products and services ranging from power generation and desalination to major construction projects, engines, military equipment and construction equipment. Doosan Industrial Vehicles (UK) Ltd was established following the acqusition of Daewoo Heavy Industries in 2005 by the Doosan Group. The company is now part of a $12bn organisation that stretches across the globe and is the name behind one of the UK’s leading forklift brands. The Doosan Way is our unique way of doing business that has sustained Doosan for more than ten decades, and has given us a competitive edge for the future. As a values-based management system, it guides us as we set goals and make strategic decisions, and as we work to reach our company’s aspirations and fulfill our vision. Fork Truck Direct has been trading with Doosan for 10 years now and in that time has sold over 1000 new Doosan forklifts and countless second-hand and refurbished Doosan & Daewoo trucks as well. Throughout this 10 year period we have won many awards from Doosan for regional sales excellence, contribution to sales, marketing and even best new dealer way back in 2003. Fork Truck Direct has grown as a business year on year to become one of the largest and most successful independent forklift dealers in the South East, and this is largely thanks to Doosan’s continued support, as well as their excellent product range and service. It has been a privilege to work with Doosan over the past 10 years, and as a company, Fork Truck Direct is extremely proud to be a Doosan dealer and promote the Doosan brand. Although there are currently many forklift brands available in the UK market today, we at Fork Truck Direct believe that the Doosan products are amoung the most robust, efficient and reliable; and as a result, offer the best value for money. As the leading independent forklift dealer for Doosan, in the UK, we can offer you the full range of Doosan forklifts for sale, long term rental or hire, with superb service support to match, in Essex, Suffolk and the surrounding areas. At Fork Truck Direct, we’re among the most successful independent forklift dealers in the south-east of England. Our partnership with Doosan is incredibly strong and spans over a decade. During this time we have won multiple awards for performance in a range of areas including excellence in sales and marketing. At Fork Truck Direct, we pride ourselves on doing things ‘the Doosan Way’ and this has continually given us a competitive edge in the marketplace. We’ve always put the customer first, focusing on providing you with a fast and efficient service. Our staff have extensive experience in handling all customer concerns to make sure that we give you the best support and value for your money. With an unrivaled understanding of the industry and of the Doosan range of forklifts, we can guarantee you the professional advice and guidance you need to make the right decision on your materials handling needs. We have successfully sold more than 1,000 new Doosan forklifts since our inauguration as dealers and have subsequently won various awards for being the leading independent distributor. Whether you’re interested in buying or hiring forklifts, look no further than the Doosan range of forklifts and Fork Truck Direct as your provider. We offer extremely competitive rates for hire, rental and outright purchase. Call us today – our professional team is on hand, ready to discuss the best solutions for your materials handling needs. Wonderful company, they have been supplying our company with forklifts for 5 years. When ever there is a problem which is rare! A technician is there within 24hrs. Great company to do business with. We, Fork Truck Direct, are the leading independent forklift dealer, for Doosan, in the UK. We offer the full range of Doosan forklifts for hire and sale across Essex, Suffolk and the surrounding areas. So, if you’re looking to purchase or hire a Doosan forklifts in this area, then look no further. Doosan is a Korean manufacturer of forklifts, and is one of the world’s leading forklift brands. A Fortune 500 company with a history dating back 500 years, Doosan supplies forklifts to many major organisations around the world, and boasts a very strong presence in the UK. With its slogan declaring the company’s tenet of ‘Simple Powerful Performance’, Doosan certainly lives up to its own motto. Every Doosan forklift model is designed according to a singular vision: ensuring that Doosan forklifts offer the best value for money on the market. All Doosan forklifts are constructed from durable and rugged components that guarantee the least amount of maintenance during a lifetime of the machines’ operation. 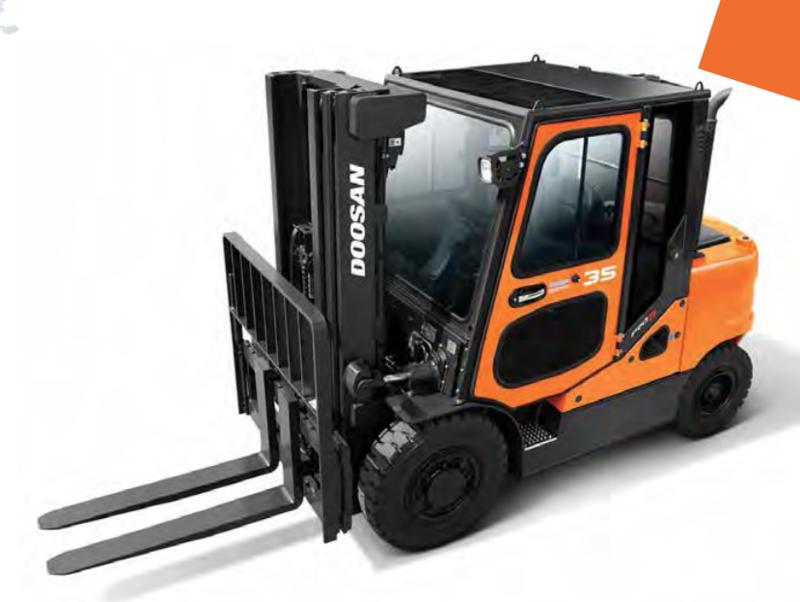 The Pro-5 Series forms the foundation of Doosan’s remarkable success in the forklift industry. These forklift trucks are simply constructed, focusing on reliability and robustness, to offer the value-for-money for which Doosan is renowned. The Pro-5 Series, comes in LPG, diesel and electric models, all of which incorporate world-class ergonomics into their very design, along with impressive engineering features, such as oil-cooled disc brakes, and an integrated side shift included as standard. Consider the range’s safety features, which have won numerous industry awards, and you will see why the Pro-5 Series continues to be the benchmark for forklifts. The Doosan Pro-5 Series comes in 88 varieties (in electric, diesel, or gas), and can lift loads ranging between 1.0 and 16.0 tonnes. Doosan is proud of its commitment to the environment, and takes measures to ensure that its premium forklift trucks are as ecologically sound as they can be. The LPG trucks manufactured by Doosan offer among the lowest emissions of any forklift on the market. An extensive three-year warranty, which covers both labour and parts, comes as standard with any Doosan forklift for sale, offering an added layer of peace of mind, beyond the low-maintenance nature of their machines. Whether you’re looking to hire Doosan forklifts, buy Doosan forklifts, or simply rent Doosan forklifts, Fork Truck Direct can provide you with the machine you need. Call us on 01245 322252, and let a member of our professional team arrange the ideal forklift solution for your business. Do not hesitate to get in touch with our friendly team if you’re looking for Doosan forklifts to buy, rent or even short term hire.